Westshore Town Centre offer more than 81 brand name stores. Westshore Town Centre is located in Victoria, British Columbia - 2945 Jacklin Road, Victoria, V9B 5E3 (GPS: 48.441444, -123.51124). 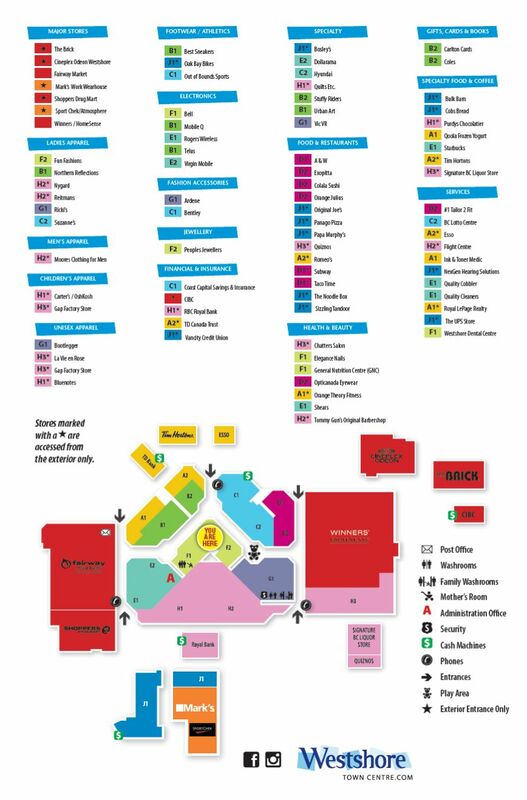 Look at the list of stores in Westshore Town Centre, hours, location and information about mall and special events, sales, coupons. You can choose store from list below and get detail information - other stores locations for the brand, location, shopping hours, phone, map, directions contact. Westshore Town Centre is one of the best shopping place for spend your free time - mall/shopping center has all types of stores - outlets, department, fashion, traditional and more. Have you ever visited Westshore Town Centre? Do not forget to write shopping review and rate your satisfaction. I’m very disappointed with this st up. Not everyone can afford to buy the photos they take. But of course they won’t allow a family member to take a photo. I’m seeing this more and more Canadians ripping off Canadians for the cash. No ne seems to consider families who are on the low income side. It’s just too bad for you.i used to do all my shopping there now I will go elsewhere and hope they are not ripping everyone off. Give us your experience with Westshore Town Centre by writing a short review.